Banks have opened multiple channels to assist their customers in the bank account-Aadhaar linking process. If you haven’t linked your Aadhaar card – or the 12-digit Unique Identity Number (UID) issued by the UIDAI (Unique Identification Authority of India) – with your bank account yet, you are required to do so by December 31, 2017. While the government has set a December 31 deadline for existing holders of bank accounts to seed their Aadhaar number (UID), the revenue department has said failing to do so will result in the account becoming inoperable. The UIDAI, the authority that issues Aadhaar card, has said the linking of UID (Unique Identity Number) with bank accounts and mobile SIMs, among others, is mandatory and deadlines are “valid and lawful” as of now. Bank accounts have to be linked to Aadhaar by December 31. SBI customers can access any of the bank’s ATMs to seed their Aadhaar with the bank account. After swiping the ATM card and entering your PIN, Select the menu “Service – Registrations”. Select Aadhaar Registration (or inquiry as per your need). Select the account type. Confirm the same by re-entering it, according to the bank’s website. SBI customers having subscribed to the bank’s internet banking facility can log into www.onlinesbi.com and access the link “Link your Aadhaar number” under “My Accounts”, appearing on the left panel of the screen, according to SBI. Clicking on the link directs the user to a screen where he or she has to select the Account number, input the Aadhaar number and click on ‘Submit’. The last two digits of registered mobile number (non-editable) will be displayed to the customer, according to SBI. The status of mapping will be advised to the customer’s registered mobile number, it noted. SBI customers can visit any branch of the bank with a copy of their Aadhaar number or e-Aadhaar. At the branch, a Letter of Request will be obtained from customer along with the Xerox copy of Aadhaar letter. After necessary verification, the Aadhaar linking will be done by the branch. An SMS will be sent to customer’s registered mobile number regarding the status of seeding, SBI adds. Click on ‘Services’, and under the ‘Instabanking Services’ section, click on the ‘Update Aadhaar’ option. “Once you submit the number, we will call you to assist with iMobile activation. Please ensure that the mobile number is registered for mobile banking and has GPRS facility activated,” ICICI Bank adds. After this, the user is required to enter the 12-digit Aadhaar number and then re-enter. Proceed by clicking on ‘Submit’. Select Aadhaar Updation under the ‘More Options’ section in the menu. Enter the 12-digit Aadhaar Number, re-enter it and proceed by selecting ‘Submit’. Dial ICICI Bank’s customer care number. Press 1 for ‘banking accounts’. “Alternatively, you can also press Option 5 in “Self Banking Menu” to update your Aadhaar number or choose Option 9 to speak to the officer,” ICICI Bank adds on its website. Login to HDFC Bank’s net banking service. Select the ‘request’ section under the Accounts option and click ion ‘View/Update Aadhaar Number’. Select the Account to which you would like to link your Aadhaar Number. Re-enter your Aadhaar Number and click on ‘Update’. Click on ‘Confirm’ after checking all your updated details. Login to MobileBanking App. Select the ‘Request’ section under Accounts option and tap on ‘View/Update Aadhaar Number’. Re-enter your Aadhaar Number, tap on ‘Update’ and then tap on ‘Confirm’ to submit the details. “You can send an SMS from your registered mobile number to 5676712. 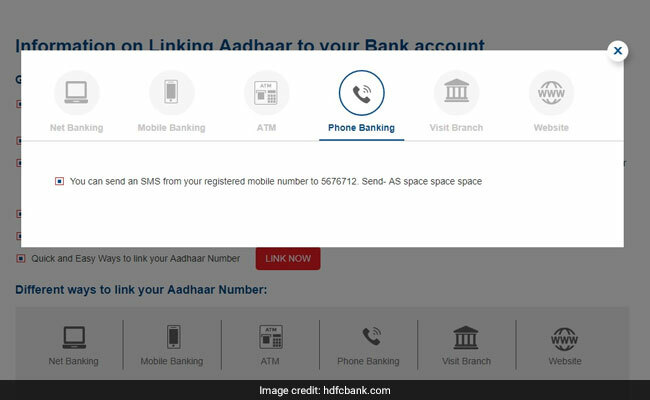 Send- AS space space space,” HDFC Bank mentions on its portal. For example, send 123456789101 AC 691320 to 5676782, here 123456789101 is your Aadhaar number and 691230 are the last 6 digits of your account number, Axis Bank explains on its website. After receiving your SMS, the bank will process the same at the back-end. You will be notified once the process is complete, says Axis Bank. Click on the ‘Aadhaar Seeding’ link for registration. Select ‘Link Aadhaar Number’ from the options. Confirm your Aadhaar card number by clicking the ‘Confirm’ button on the screen. Axis Bank also provides an offline route – by way of a branch visit in person – to enable its customers to link their savings account with the Aadhaar card.